All creatures waggy, furry and purrrry……welcome to the world of Kelperland Veterinary Centre. As ever we have been extremely busy of late – animals continue to amuse us and challenge us every single day! We’ve had a couple of interesting cases really that I’d like to share with you. A lovely springer spaniel called Charlie was brought down to us by his owners having been sick a couple of times. Our vet Eve decided to take an X-Ray of his abdomen to see if we could find a reason for his illness. Often in our job it is an exercise in detection – can we find out the cause of a particular problem using a few tests as possible in order to minimise intervention with the pet and cost to the owner’s wallet! Most of the time several tests are required before it becomes clear what is going on. In Charlie’s case however, it was perfectly obvious from the first X-Ray – he had eaten a sewing needle! You can see it there on the X-Ray – metal shows up white on X-Rays and there it is clear to see, you can even make out the ‘eye’ of the needle on the left end of it! The problem then was what to do about it. 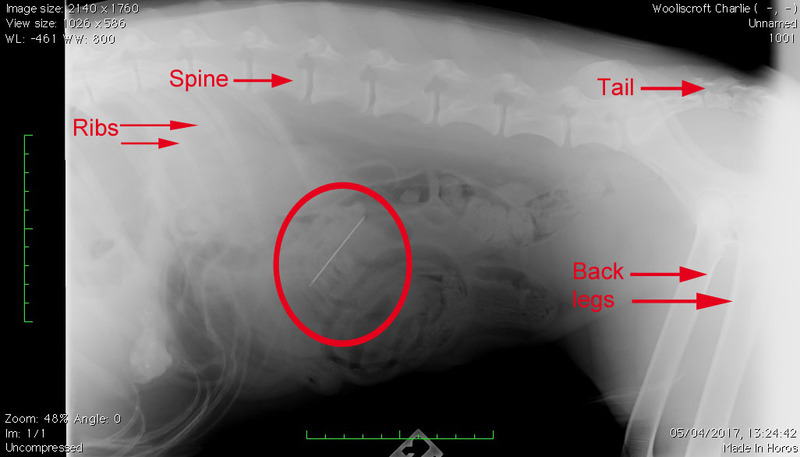 Clearly a needle is very sharp and leaving it to work its way through Charlie’s intestines was not an option in case further (and potentially catastrophic) damage occurred. So we took him straight to surgery. The sock was located in a section of Charlie’s small intestinal gut – it was wrapped within a sock which was lodged in his intestine! 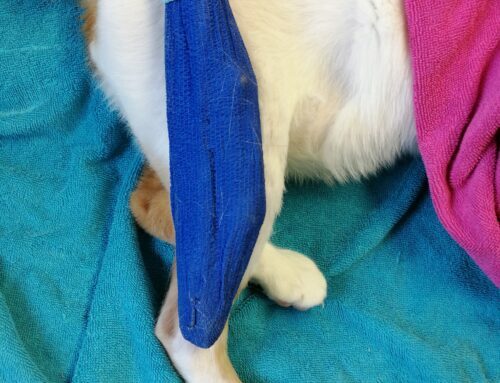 The sock and needle were well and truly stuck which is why Charlie started vomiting – there was nowhere for food and water to pass down through his body. Thankfully Charlie has made a full recovery. Whilst we can now look back with amusement at the episode it was extremely serious – either ingesting the needle itself, or the surgery which was required to remove it, could have resulted in him becoming extremely unwell and possibly dying. So we are so happy he’s back to his normal mischievous self! We’ve had two lovely female dogs in this month with the same problem of an infection in their uterus. Sam is a 12 year old Labradoodle. She was mildly off colour for a while so we scanned her abdomen with an ultrasound machine – just like the pregnancy scanner used by human doctors. We could see that Sam’s uterus was slightly larger than normal and suspected an infection called a pyometra. We could also see on the scan a growth on Sam’s spleen, which was a concern. Explorative abdominal surgery was performed. We did indeed find an infected uterus which was surgically removed – uterine infections cannot be treated successfully by antibiotics alone and always need surgery in the end. The growth was discovered to be connected to her spleen so her spleen was removed at the same time. The spleen is an important organ within the body but it can be removed with no long term ill effects. We sent the growth to the lab and were hugely relieved to find out that it was a large, harmless, excessive growth of tissue – not cancer. Which was wonderful news. 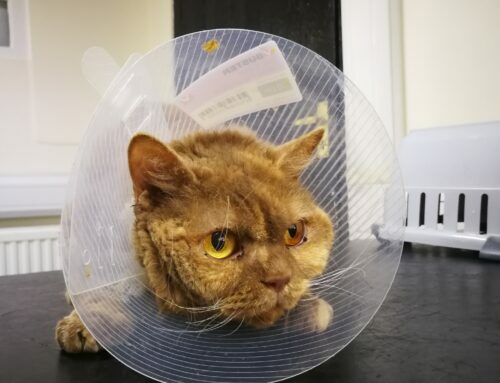 Understandably, it has taken Sam a few weeks to recover from such a big operation, but she is well on the way to making a full recovery and her long term outlook in very good. Sasha is a gorgeous 1 year old Dog de Bordeaux. She also had an infected uterus. This is actually very rare in young dogs (normally it happens in older dogs due to hormonal imbalances) and we performed several tests to confirm our diagnosis. The downside to this diagnosis is that the treatment is surgical removal of the uterus – which means that dog cannot have a litter of puppies in the future. Occasionally we can treat the infection with medication to settle it and ‘buy us time’ if the owner truly wants to breed from the dog. 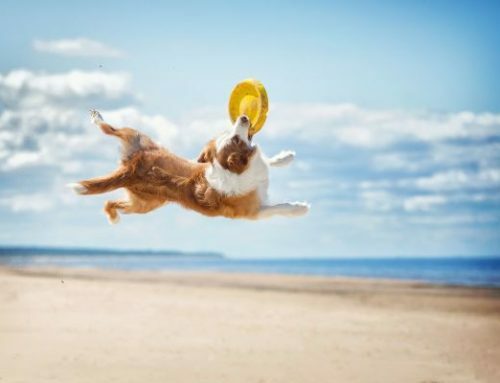 The problem with this technique though is that it can cause the dog to become unwell in the meantime, and the surgery will always be required in the end. 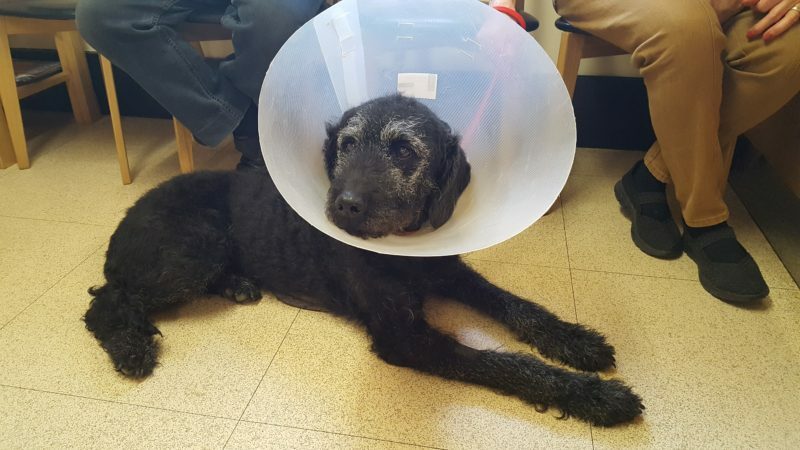 After some soul searching Sasha’s owners decided to go ahead with the surgery – which was performed uneventfully and Sasha has gone on to make a full recovery! 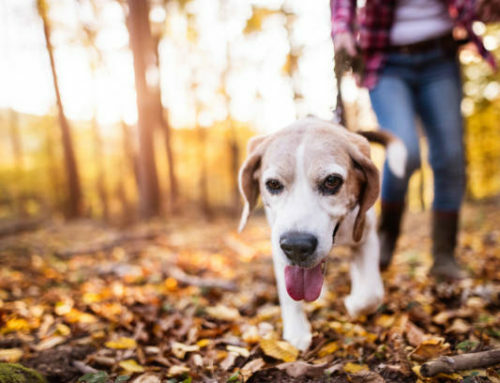 Uterine infections in dogs are one of the reasons why we would always recommend speying (or neutering) your female dog in the first year of her life. Speying also prevents certain cancers from causing trouble in later years and most of all prevents unwanted puppies (there are too many puppies in the world sadly without homes, just ask the rescue centres.) Deciding whether or not to spey your female dog can be a big decision though, if anyone wants any advice on this subject then just give us a call and we can discuss.